He has done just three films in five years but Mannan Shaah has left a mark what with several of his compositions striking a chord with the listeners. 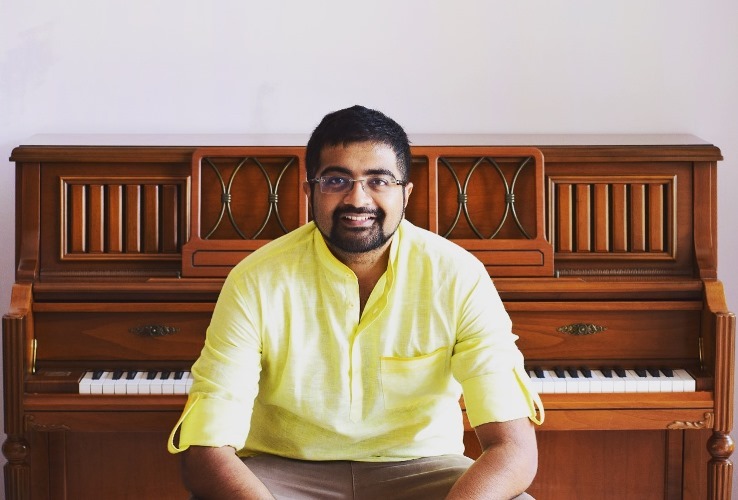 In this interview, the young music composer talks about creating the soundtrack of ‘Namaste England’, working with Javed Akhtar, his take on recreating old songs and upcoming projects. ‘Namastey London’ had a very popular soundtrack. Did you feel a pressure on you while working on the music of ‘Namaste England’? There was no pressure but it was definitely a challenge. ‘Namaste England’ was from the same series but it was not a sequel to ‘Namastey London’. The two films are completely different from each other. The situations, where he had to place songs, were completely different. To design songs as per the situation was the only challenge. ‘Main Jahaan Rahoon’ was the most popular song from ‘Namastey London’. Rahat Fateh Ali Khan has a song in ‘Namaste England’ as well. Did you think that could have led to comparisons? I do not think there can be any comparison between the two songs. ‘Main Jahaan Rahoon’ is a happy song where you see Rishi Kapoor’s character and his family coming to India after a long time and visiting different places. ‘Tu Meri Main Tera’ arrives at a time when Param (Arjun Kapoor) is travelling illegally to London. The song carries a sad emotion. He is thinking about his wife and hopes to bring her back. The song is in a similar space as ‘Bhar Do Jholi Meri’ which was a qawalli and had a travel element to it. You worked on the film for a very long time. I worked on the soundtrack for two years but Vipul (Amrutlal Shah, director) ji had discussed the film with me a long time before that. When I was working on ‘Commando’, I had attended a couple of script narrations for ‘Namaste England’. So, I was already offered the film when I was working on ‘Commando’. He actually wanted to use ‘Saawan Bairi’ and ‘Lut Jawaan’, the two songs from ‘Commando’ in ‘Namaste England’ but by then, Dilip Ghosh (director, ‘Commando’) had already heard the song and really wanted to use them in the film. Vipul ji was gracious enough to let use those songs for ‘Commando ’. There were discussions regarding the film for a long time but I started working actively on the film in 2016. We locked three songs, ‘Tere Liye’, ‘Tu Meri Main Tera’, and ‘Dhoom Dhadakka’ in the first couple of sittings. ‘Tu Meri Main Tera’ and ‘Dhoom Dhadakka’ are very crucial to the film and once we got those songs, we felt relieved and were sure that we would be able crack the rest of the songs too. Was it intimidating to work with a veteran like Javed Akhtar? Not at all! Javed Saab is a very fun person to be with. He keeps cracking jokes and one-liners all the time. I met Javed Saab for the first time in 2014. We were supposed to do a film which did not see the light of day. We even created a few tracks together back then. By the time we started working on ‘Namaste England’, we had become very comfortable with each other. Javed Saab understands my melodies very well and he is very flexible as a lyricist. He is very child-like and understands the young mind. If I tell him that something is not working out, he will very sportingly change or modify it. You started out as a singer with a song in ‘Kucch Luv Jaisaa’. Yes, I had sung ‘Badal Pe Paaon’ and ‘Thoda Sa Pyaar’ in the film. I did not have the ambition of becoming a playback singer but I liked to sing. I composed my first tune when I was fifteen years old. So, composing was always at the back of my mind but it is only after I assisted Pritam da for two years, I realised that I wanted to become a full-fledged composer. You have also sung a song in ‘Namaste England’. Vipul ji wanted me to sing ‘Ziddi Hai Dil’. I wanted someone else to sing it but he thought that my voice suited the song and would work well for the situation. Your first two films ‘Commando’ and ‘Commando 2’ were actioners. Being a romantic drama, did ‘Namaste England’ give you more scope to explore yourself as a composer? Yes, the biggest challenge is always to create a soundtrack for a love story. A composer gets the opportunity to prove its mettle and show his versatility in a romantic film as there are songs of different flavours and moods in it. ‘Dhoom Dhadakka’ is a dance number, ‘Tere Liye’ is a romantic number, ‘Tu Meri Main Tera’ has a qawalli base to it, ‘Ziddi Hai Dil’ is a sad song. There is another song called ‘Kya Kahoon Jaaneman’ which I composed in just three notes. I had seen a video of Ilaiyaraaja doing a rendition of a song, composed in three notes, in front of a thousand people. Shreya Ghoshal had sung it. I got inspired by it and thought I should attempt to do something like that as well. Shashaa Tirupati has sung the song amazingly well. There was a remixed version of ‘Hare Rama Hare Krishna’ from ‘Bhool Bhulaiya’ in ‘Commando 2’. There were two recreated tracks (‘Proper Patola’, ‘Bhare Bazaar’) in ‘Namaste England’ as well. How do you look at this trend of recreating old songs? This trend started in the 90s. They used to remix songs from the 60s and 70s and release them as albums. Now, they are recreating songs and using them in films. They are mostly recreating dance numbers. Given a chance, music director can come up with good, original dance numbers. ‘Dhoom Dhadakka’ is an original dance track and it has been received very well by the listeners. I think this a trend that will fade away in the next couple of years. If you are offered to recreate an old song, would you do it? I would look into the situation. I would like to recreate lesser known songs which have gone unnoticed in the past. It would be great to introduce such songs to the youth in a new avatar. You have worked with two cross-border talents Rahat Fateh Ali Khan and Atif Aslam on this film. How was the experience of working with them? I recorded both of them in Dubai. When I was working with Pritam (Chakraborty) da, Atif used to come to his studio in Mumbai and record. He was most of the time in Mumbai then. He has vastly evolved as a singer. He recorded ‘Tere Liye’ in just an hour and a half. Rahat Saab is known for songs like ‘Tu Meri Main Tera’ but he had never sung a song in a 7:8 rhythm or in rupak taal. Though we had earlier collaborated on ‘Saawan Bairi’ (‘Commando’), we could not meet then and I recorded his over Skype. This is the first time I got to meet him and it was a great experience. He is a very warm-hearted and humble person. You have done just three films in five years. Are you selective about the work you do? Actually, there has just been a year-long gap between ‘Commando 2’ and ‘Namaste England’. After Commando’, I wanted to take a break and learn more as a composer. I took some time off and worked on a lot of tracks. These days, most composers keep a stock of songs to pitch them to filmmakers. Do you have a music bank? I do compose songs regularly and record them. Sometimes, you make somebody hear a song from you music bank and it gets approved and there are times when you create a fresh song keeping in mind the situation in the film. Though there have been contributions by other composers in ‘Commando 2’ and ‘Namaste England’, you have largely carried the three films on your own shoulders as a music composer. Would you be open to being a part of a multi-composer setup? Yes, I am open to doing one or two songs in a film. Sometimes, when you do an entire album, you realise a couple of songs are not promoted well and you feel sad about it. On the contrary, you might do just one song in an album and that could turn out to be most well-promoted or the most popular song in the album. ‘Commando 3’ is your next film. Have you started working on it? Yes, I have begun working on the film. One song has already been shot. They have already finished a schedule in London. They will start shooting for the next schedule in Mumbai in December. In this film, most of the songs are used in the background. There are some montages where we have placed the songs. The songs will help in taking the story forward. Apart from ‘Commando 3’, I am doing a film which will be directed by a friend of mine. I will start working on that film in January.